Simon & Schuster, 9781416590316, 912pp. “Extraordinary…a great American biography” (The New Yorker) of the most important African-American of the nineteenth century: Frederick Douglass, the escaped slave who became the greatest orator of his day and one of the leading abolitionists and writers of the era. As a young man Frederick Douglass (1818–1895) escaped from slavery in Baltimore, Maryland. He was fortunate to have been taught to read by his slave owner mistress, and he would go on to become one of the major literary figures of his time. His very existence gave the lie to slave owners: with dignity and great intelligence he bore witness to the brutality of slavery. Initially mentored by William Lloyd Garrison, Douglass spoke widely, using his own story to condemn slavery. By the Civil War, Douglass had become the most famed and widely travelled orator in the nation. In his unique and eloquent voice, written and spoken, Douglass was a fierce critic of the United States as well as a radical patriot. After the war he sometimes argued politically with younger African Americans, but he never forsook either the Republican party or the cause of black civil and political rights. In this “cinematic and deeply engaging” (The New York Times Book Review) biography, David Blight has drawn on new information held in a private collection that few other historian have consulted, as well as recently discovered issues of Douglass’s newspapers. “Absorbing and even moving…a brilliant book that speaks to our own time as well as Douglass’s” (The Wall Street Journal), Blight’s biography tells the fascinating story of Douglass’s two marriages and his complex extended family. “David Blight has written the definitive biography of Frederick Douglass…a powerful portrait of one of the most important American voices of the nineteenth century” (The Boston Globe). David W. Blight is Class of 1954 Professor of American History and Director of the Gilder Lehrman Center for the Study of Slavery, Resistance, and Abolition at Yale University. He is the author or editor of a dozen books, including American Oracle: The Civil War in the Civil Rights Era; and Race and Reunion: The Civil War in American Memory; and annotated editions of Douglass’s first two autobiographies. He has worked on Douglass much of his professional life, and been awarded the Bancroft Prize, the Abraham Lincoln Prize, and the Frederick Douglass Prize, among others. “Extraordinary. . . . Blight has certainly written, in the book’s texture and density and narrative flow—one violent and provocative incident arriving right after another—a great American biography." 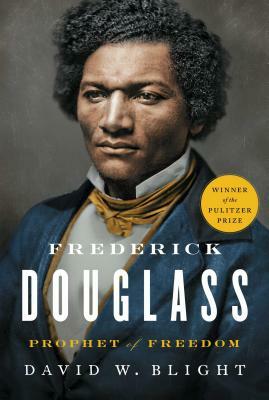 — Eddie S. Glaude, Jr.
"David W. Blight brilliantly captures this legendary figure and his times in the magnificent Frederick Douglass: Prophet of Freedom, one of the best biographies of recent years. Blight’s portrait of Douglass is engrossing, moving, nuanced, frightening—and certainly thought-provoking." “Meticulously detailed. . . . . The Douglass who emerges from this massive work is not always heroic, or even likable, but Blight illuminates his personal struggles and achievements to emphasize what an extraordinary person he was."